Panasonic 12-60mm F3.5-5.6 is an Auto Focus (AF) Standard Zoom lens with FourThirds max sensor coverage. When mounted on a FourThirds sensor camera, it will give you an FF equivalent focal range of 24 - 120mm. With a max aperture of f3.5 at 12mm, we can not consider this lens fast on wide end and neither at tele end with its f5.6. This lens features on optical image stabilization which helps capturing sharper images at lower shutter speeds. 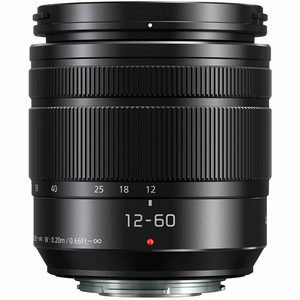 Panasonic 12-60mm F3.5-5.6 is weather sealed which makes it an ideal lens for outdoor use, especially when coupled with a weather sealed camera body. is the Panasonic Lumix G Vario 12-60mm F3.5-5.6 ASPH Power OIS a Weather Sealed lens? is the Panasonic Lumix G Vario 12-60mm F3.5-5.6 ASPH Power OIS an Autofocus (AF) lens?